MAC versus PC – The Debate Continues…. I am still searching for the perfect family computer. I know that I want a all-in-one desktop where the guts of the computer are in the back of the computer screen (I have a small space in our family room for a computer). My first round of research came up with two desktops in the running: the Dell XPS One and iMac. 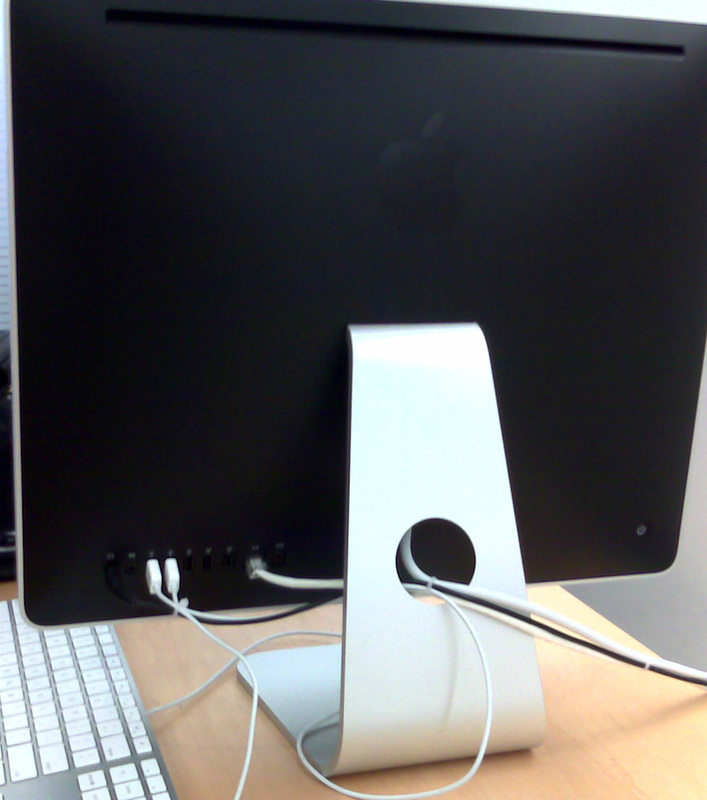 The picture on the left is the back of the iMAC (yes – that is the whole computer in one!) that the folks at the Apple store were nice enough to let me take). The Dell XPS One has a similar look from the picture I saw online. Staples carries Dell computers so I will head over there to see if I can take a look at the Dell XPS One. We have a few Windows based laptops already – but I am ready to have a computer in our family room with a screen – big enough for three kids to see. So really, the decision may come down to MAC versus PC. My son really wants a iMAC because it is so easy to use, but I have been a PC user for years and may not be ready to switch… On the other hand I am getting tired of all the crapware on PC’s and know that MAC’s get less computer viruses (for now…). "There are all kinds of theories to explain the sudden resurgence: the lack of viruses, the iPod halo effect, the critical mass of Apple stores, the disappointing debut of Windows Vista, all those Apple TV ads, the switch to Intel chips (meaning that Windows programs run on a Mac) — or maybe all of it together." 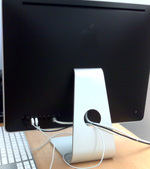 The second article is on the Leopard operating system ("Apple Offers New Goodies in Leopard"). I just purchased a new HP laptop – as soon as I start using it I will have my first experience with using Windows Vista (the Windows operating system being compared with Leopard). I also saw some interesting articles from another member of my personal review team: Walt Mossberg. On issues like sharing multiple computers with a switch (PC and MAC, Joined at the Switch) and thoughts on the Leopard Operating system. But it was a user question on switching to a MAC that brought Walt Mossberg and David Pogue together on the All Things Digital blog. Walt Mossberg recommended this book written by David Pogue "Switching to the Mac: The Missing Manual". All of this is important information for me because if I buy a MAC there are many things I will need to switch over to from my PC. As for my decision, I am still confused…. Wired has a review of the Dell XPS and had good things to say except that the "Mac-like looks yield a Mac-like price". Any thoughts? Any tips from those that recently purchased a family (shared) computer? I’m a die hard PC girl… but then again I’m Microsoft Certified to fix PC’s and servers. I couldn’t find my way around a Mac with a map, and that would frustrate the heck out of me since I’m so used to knowing everything about the hardware I’m using. So while I’m bias, I think you can avoid all the “crap” on PC’s pretty easily if you are careful enough. I’ve been a computer user for a long time—starting out on DOS, then Windows, OS/2, Linux and Mac. I’ve worked as a PC technician for a small company, and do computer security for a living. Both my son and I have Mac laptops. My brother has an iMac, and my parents now use a Mac Mini. Most people that I talk to say that the decision to make the switch is harder than the switch itself. For me, it boils down to a few things. From a security point of view, the Mac wins hands down. Almost no viruses in the wild, and the same for spyware and its ilk. The OS itself is a pleasure to use. It has its share of eye candy, but for the most part it actually serves a purpose. Everything is extremely well polished, and things Just Work. A lot of people coming from the PC world try and make things harder than they need to. The Mac really does make things simple. I’ve always been a big fan of alternate OSes, but the available software has always been a problem. Sure, Linux has a thousand apps to view your photos, but iPhoto just works, and works well. iMovie is great, iTunes is ubiquitous, and now with the new MS Office, there really isn’t anything you can’t do on a Mac. Er, unless you’re a gamer—in that case, you can still use Boot Camp and boot into Windows on your Mac (which reportedly runs Windows better than most PC on the market). Make the switch, you’ll be glad you did! I would suggest, if/when you switch to a Mac and if you have an Apple store near you, take advantage of the classes/tutorials that they offer at the store. It will make the switch more enjoyable for you. PC users tend to make things harder than they need to be when using a Mac. Macs are meant to be simple and enjoyable for the user. Good luck with the decision! Just really incomparable. Buy one, and you will never regret it.